The moraine landscape in Eastern Jutland is characteristic with many west-east going small river valleys. One can get the impression of this landscape while driving at the highway from the german-danish border and north. The highway passses severeal of the river valleys - unfortunally often on a dam and not a bridge. The river valleys is oftten the only places where the fauna can thrive and it uses the valleys to move from place to place. The highway dams are a very great barrier for the fauna and all ready to day it is possible to detect some inbreeding in certain mammals east of the highway due to isolation. The agricultural use of the valleys are small because of the often steep slopes along the sides and the wet bottom. On the steepest slopes it is impossible for the farmer to fertilize the grassland and a very rich vegetation can be found. 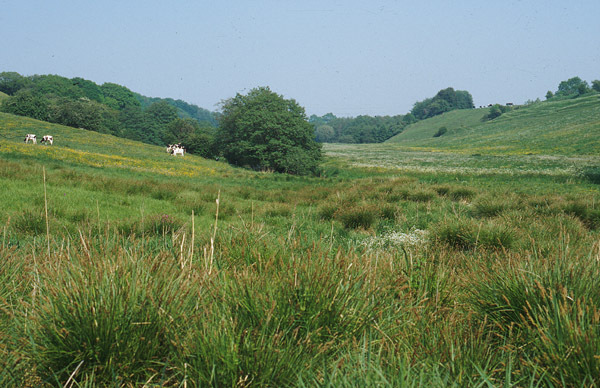 The picture shows a typical river valley in Eastern Jutland with grazing cattle.